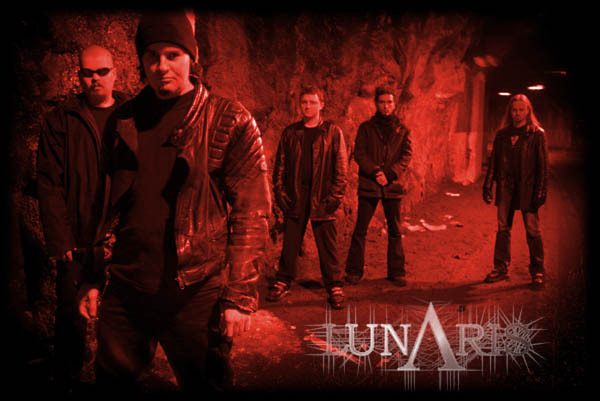 Lunaris is a Technical/Progressive Black Metal Band that was founded by guitarists M and Balfori, in the fall of 1998. Balfori, who then appeared as guitar-player of 1349, soon found his place in Lunaris as a vocalist. The spot of second guitarist was taken by the infamous Azarak (guitarist of Spiral Architect & Satyricon session). Later on formerly unknown keyboardist Ray was added to the roster. Two demos were released with this line-up, "Demo 2000" & "Creative Destruction". "On Creative Destruction" Asgeir Mickelson (Spiral Architect & Borknagar), who had previously been a member of the band, was hired as session drummer. Maztema, singer of Spiral Architect and Manitou Fame, also stepped in to do some additional clean-vocals. With him also being a supremely skilled and original bass-player, he soon became a permanent member of Lunaris. This line-up went into the studio to record the band's first studio album in February of 2001. This resulted in the 10 tracks that comprise "...The Infinite". Soon after the album was recorded, Janos, the drummer from the Italian band V.E.G.A., was drafted to fill the only vacant spot in the band. The album quickly prompted interest from several labels around the world. After a lengthy process of negotiations with several major labels one appeared from out of the blue that really caught our attention. This was the newly started Earache imprint Elitist, headed by Candlelight founder Lee Barret. Lunaris represent a new breed of Metal, breaking every rule within the genre to create something new and unique. The songs stem from main man M, whose gift as a song and text writer is surpassed by few. The addition of extremely competent musicians on all fronts makes Lunaris a truly unique experience. Individuality is the essence, and each member's personal skill combined, evolves into the sound of Lunaris.